Although I consider myself quite an adventurous foodie, there are still a lot of cuisines that I haven't delved much into. Being an Asian, I've always thought that I've already tried most of what Asia can offer. However, as embarrassing as it may seem, I wasn't able to try Thai not until last week. For a few years now, Thai restaurants have been popping up like crazy in almost all parts of the Metro. However, having a beau who's not as curious and as adventurous as me hindered us from choosing Thai over the usual Chinese, Japanese, American or Italian cuisine. It wasn't until last week that my charm got the best out of him. Yes folks, the tough nut cracked and he willingly accompanied me to Jatujak in SM Mall of Asia. Jatujak is not new to me as I've seen it countless times already. Every time I pass by the restaurant, I can't help but look at the al fresco dining area which seemed so cozy with native-looking accents and big potted plants. The inside, although quite small, was very refreshing to the eyes. The chairs may not be cushioned, but the bright lime color makes the place look interesting. 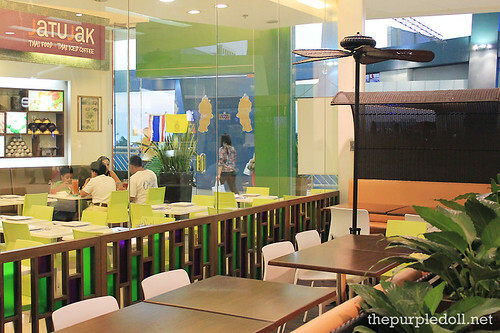 The green and cream-drenched walls are also pimped with big photos of Jatujak's food offerings which are enough to whet the appetite. Ordering wasn't a breeze since we weren't used to Thai food items. But after a few minutes, we (or rather, I) decided to start the meal off with Yam Pla Duk Foo (P195) which is a crispy catfish with mango salad. When this dish was first served to us, I was surprised to see the flakes and wondered where the catfish was. It turns out that the catfish was thoroughly shredded and fried. 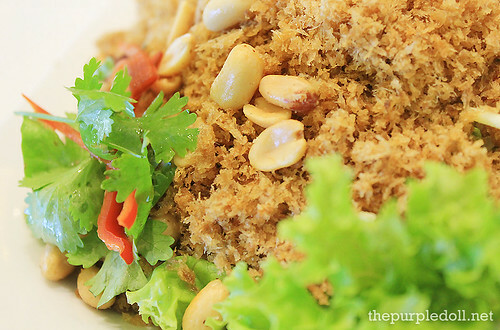 Unlike the usual salads we usually eat, the Yam Pla Duk Foo had an interesting combination of flavors and textures. The crispy catfish didn't taste anything special, but the green mangoes, as well as the sweet and sour dressing gave it a pungent kick. There were also some peanuts which added an extra crunch. However, as much as I loved the flavor, one can't eat a lot of this dish. Especially when you suffer from hyperacidity. For the main course, I ordered a serving of the Sate Chicken (P180) -- 6 pieces of skewered chicken cutlet, cooked in a curry marinade and served with minced onions and peanut sauce. Although I would've loved to order something I've never tried before, I decided to go safe for my date's sake. 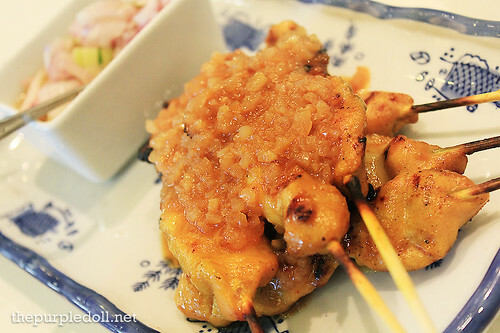 These chicken skewers were moist, tender and very flavorful. However unluckily enough, I forgot that the beau doesn't dig the taste of curry. To get us some carbs, I got the Shrimp Pad Thai (P185) -- stir-fried rice noodles with shrimps, eggs, tamarind and lemon juice, fish sauce, red pepper, beansprouts, crushed peanuts, coriander, and served with lime. Although my date is a picky eater, especially with his noodles, he actually liked Jatujak's Shrimp Pad Thai. The noodles were soft yet firm, and the flavor was a beautiful blend of sweet and savory with a little hint of tang. If you know me, you'd wonder why we didn't have desserts for this trip. However, as much as I wanted to order some sweets for dessert, I got to eat a lot already since the date didn't even get a third of everything we ordered. He just sampled a few spoonfuls of the Yam Pla Duk Foo and left me the whole bowl to finish, on top of half a plate of Shrimp Pad Thai and 4 sticks of Sate Chicken. So in replacement of desserts, here are our beverages from our Jatujak lunch date -- Thai Iced Tea (P85) for me, and Thai Iced Coffee (P75) for him. 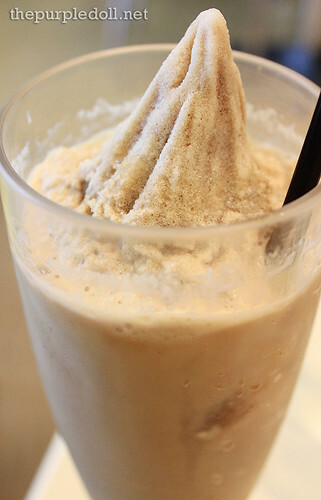 Unlike the usual lemon iced tea in most restaurants, Thai Iced Tea is actually milk tea. Among all the milk teas I've got to try though, Jatujak's is one of the best as it had a lovely sweetness yet tasted clean. It also had a distinct flavor which I can't pinpoint. One thing's for sure though, I love it! The Thai Iced Coffee on the other hand, was really sweet. If you love sweets, then this would be a perfect drink to get you started. However, if you're like the beau and I who don't really dig sweet coffee, then this can definitely be missed. The play on colors, flavors and textures of Thai dishes are different from what I was used to. However, I dig the fresh and tangy quality of the Thai food items I got to try. 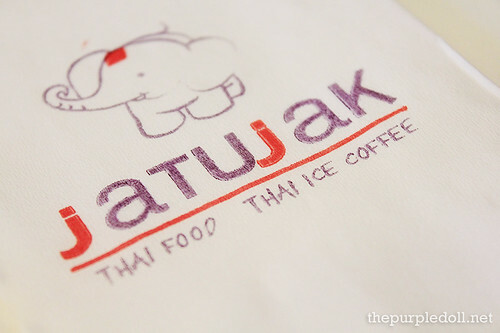 And although Jatujak is probably not the best Thai restaurant around, for a Thai cuisine newbie like me, it definitely made a good impression and had me wanting for more. I'll have to make sure the next time I visit Jatujak though, is not with the beau, but with friends who can appreciate Thai cuisine. So happy for you. =D If your Jerwin doesn't want to take you out for some Thai, I'm sure berylle and I will not resist your offer for some Thai food!=p Thai Milk Tea has a distinct taste but its quite good right? I love Jatujak! However, my husband doesn't like Thai food too. Their Tom Yum is my fave. 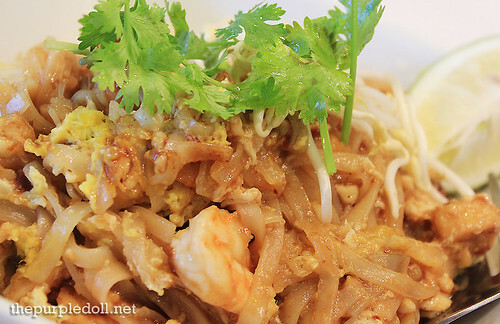 I've been to Jatujak pre-blogging days and I love their Pad Thai! :) It's kinda pricey though. i've never been here :( i love thai food. sana they will have a bgc branch! Oh wow the sate chicken looks nice. Are the food items inexpensive? really? he likes the Shrimp Pad Thai? 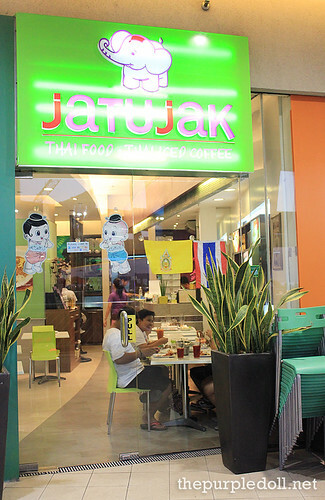 I enjoy Thai cuisine, but haven't tried Jatujak yet -- I think they also have a branch in Megamall (?). Still, my first love (Thai resto) is Sukhothai Restaurant in Mega, since the 90s! Sadly, it's long been closed. I like their tom yum :) You can choose from mild, medium, and very spicy. i miss the catfish salad here and the thai iced coffee. good thing there's a branch near where we live. @Hefty Foodie: Prices are not so expensive. About 200 to 250 per item which I think is sulit since they come in very filling portions. Their prices seem reasonable and I like Thai food! I hope they have a branch closer to where I am though. I also love thai food but I haven't tried this one yet... Might check this out! I gotta try the thai milk tea. and its pretty affordable compared to other Thai resto. I should go check this out soon. 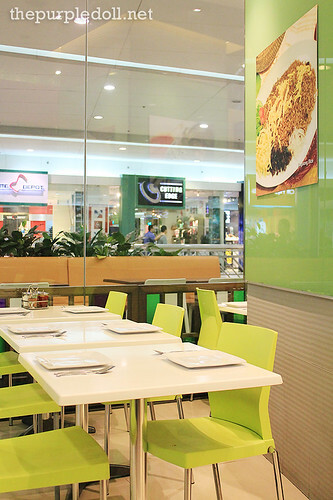 I haven't been to MOA in a while but if ever I drop by, I'll try this resto. I haven't try any THAI dishes before. You got delicious foods here. JATUJAK iced teas look refreshing! as always..I love visiting this blog kasi nakakakita ako ng ibang food not just the ususal fast food na natitikman ko.. I love Thai cuisine. I may want to try their version of the Shrimp pad thai. Something must have on my next MOA trip. wow, I think I like the thai version of food jan sa pinas compare here sa US...lol! food looks very appetizing...thanks for dropping by sis! I've known Thai cuisine as spicy. Are they? They look good especially the sate chicken. Maybe I could ask my Thai friend to accompany me and try this resto and he could give some ideas on what's best to order. I love Thai foods! I usually base a good Thai restaurant based on their Tom Yum, Larb, and fresh spring roll dishes, as these are the usual foods I order. especially of their peanut sauce, sooooooo yummmmyyy!!! !